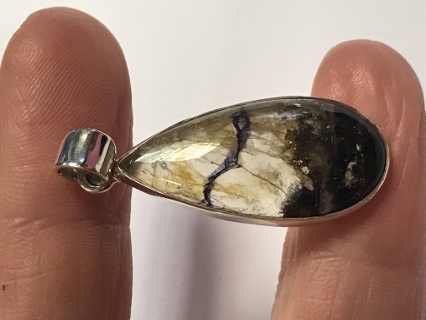 An attractive teardrop of Blue John, set in a 925 silver pendant. Blue John is a variety of Fluorite with a high bitumen content, giving it golden to white and deep purple contrasting colours. Key Healing Properties: Blue John is chosen in crystal healing for boosting mental agility while providing a protective aura of confidence to explore new dimensions.